Dozens of musicians celebrate Bob Dylan's 69th birthday tonight (sans the man himself). 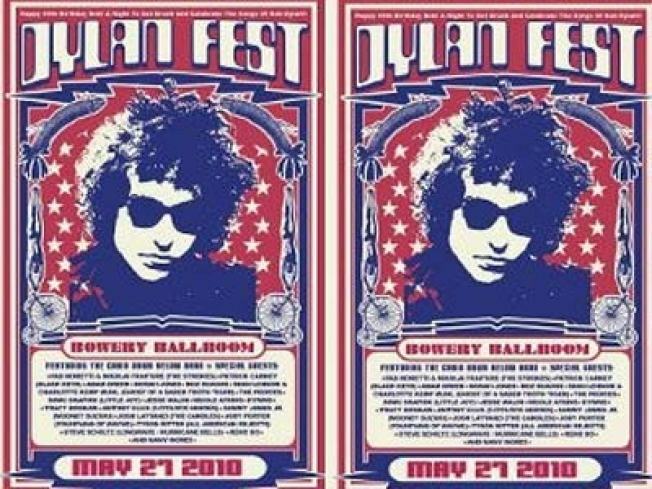 FOREVER YOUNG: On the occasion of his 69th birthday, a who’s who of the NYC music scene and beyond huddles together to pay tribute to one of America’s greatest living troubadours in Dylan Fest 2010: A Night To Get Drunk And Celebrate The Songs Of Bob Dylan! On hand at Bowery Ballroom: Fab Moretti and Nikolai Fraiture of the Strokes, Nicole Atkins, Jody Porter of Fountains Of Wayne, the Cabin Down Below Band and many more. 9PM. DOUGH RE MI: The humble dumpling pops up in nearly every national (and sometimes even regional) cuisine on the planet. Tonight, Wai Hon Chu—chef and author of “The Dumpling: A Season Guide”—comes to the Tenement Museum with some special guests to talk about the foodstuff’s tasty but impoverished beginnings. Fittingly, the Rickshaw Dumpling Cart will be on hand for this event. 6:30PM. HARDSCORE: B.Y.O. board and tiles to the 92nd Street Y tonight and prepare to get straight-up schooled by three-time National Scrabble Champion Joe Edley in a rare strategy masterclass. Sure, they say “all levels welcome,” but you’d best brush up on your Q-words-that-don’t-need-a-U if you know what’s good for you. 7PM.